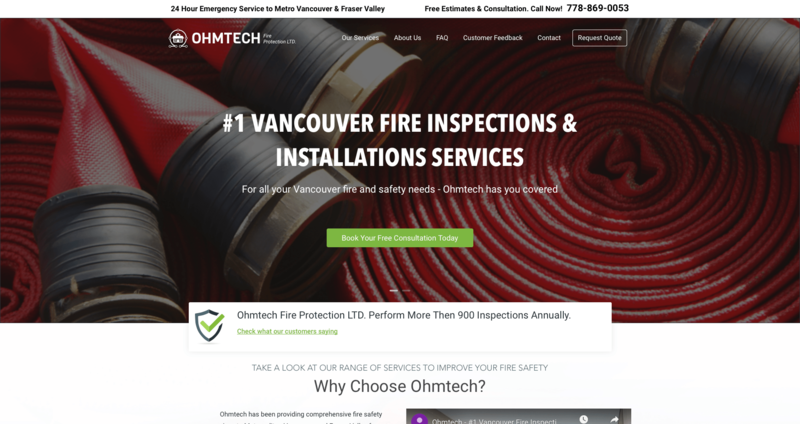 Professional website development and design for Ohmtech Fire Protection LTD.
Ohmtech is a local Fire Protection Agency located in Vancouver, Canada. Their number one priority is fire prevention and thus, they are motivated to make Vancouver a safer community for its people. The team of Ohmtech is known for their unparalleled skill set and knowledge about fire protection and safety awareness. 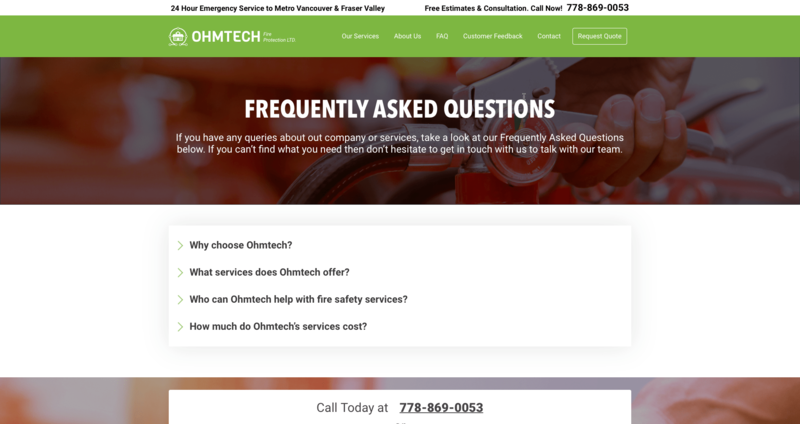 Furthermore, Ohmtech wanted to create a responsive website that would cater to the needs and concerns of the people of Vancouver. To keep up with the digital age, having a simple and very easy to navigate website is one of the best ways for people to easily reach out to your business or organization and vice versa. Lastly, it’s also a great platform to showcase the services that they offer and gather customer feedback. We made sure to achieve these goals. For this project, we customized a WordPress website from start to finish. 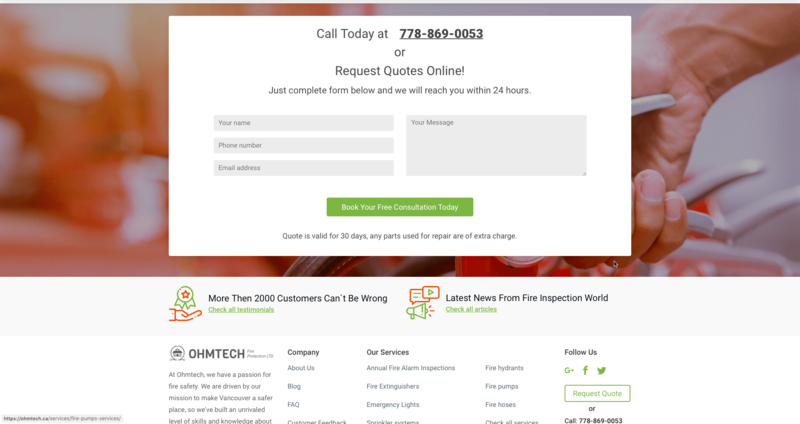 We had one goal in mind and that is to create a service-centered page for Ohmtech Fire Protection LTD. 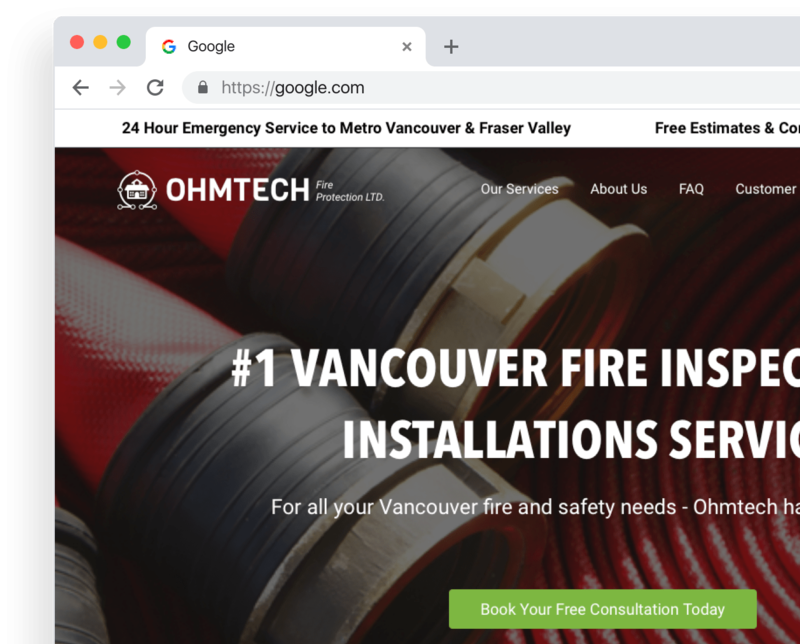 Ultimately, we want to help the people of Metro Vancouver and Fraser Valley have easier access to Ohmtech whenever the situation calls for it. Primarily, we created a responsive WordPress design with the help of wireframes. Responsive design is very important for this project because we want the website to reflect the quality that the team of Ohmtech espouses. We created a specific page for the range of fire protection services that Ohmtech offers. 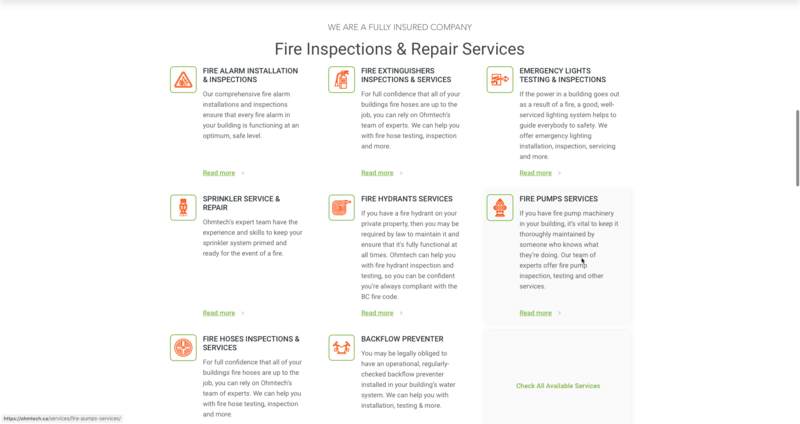 They cater to an extensive range of services to help keep the community safe from fires. You can know more about each of the services by clicking on the “find out more” button. You can learn more about fire safety and protection by heading to the blog section of the website. We also incorporated a consultation plug-in to the website. With this, possible clients can request for a quote of Ohmtech services on their property just by providing the contact details. Satisfied clients can also leave a review for Ohmtech on the client feedback page. As Ohmtech strives to provide an excellent and professional service, client feedbacks posted on the website are a testament to the quality of their work. For an easier and faster transaction, the FAQ page serves as a guide for Ohmtech clients. Through this, they will be able to learn more about Ohmtech and its services. Last but definitely not the least, all the aforementioned features and more make up the entire responsive Ohmtech website and it works perfectly on mobile devices, tablets, and desktop computers. We used fully custom WordPress CMS design for this project. Company Website for BC Best Flooring Let`s Make Something Awesome!